KIEV, Ukraine -- The Ukrainian government says its forces have retaken two more eastern cities from pro-Russian rebels. Ukrainian troops removed boxes of weapons and ammunition from a recaptured building. The website of Ukrainian President Petro Poroshenko said the national flag was raised in Artyomivsk and Druzhkivka. It comes a day after government forces regained control of the rebel stronghold of Slavyansk. Meanwhile, large crowds have attended a rally in the regional capital, Donetsk, in support of the rebels. The BBC's David Stern in Kiev says Artyomivsk and Druzhkivka are not considered as strategic as Slavyansk but re-taking them indicates momentum is currently with government forces. "There is a clear strategic plan, which has been approved. These cities will be completely blockaded," he said. "These measures will result in the separatists - let us call them bandits - being forced to lay down arms." At the rally in central Donetsk, separatist fighters were cheered by thousands of supporters waving the flags of Russia and of the self-proclaimed Donetsk People's Republic. Correspondents said armed fighters from Slavyansk could be seen walking through Donetsk on Sunday, many still wearing military camouflage. "We will begin a real partisan war around the whole perimeter of Donetsk. We will drown these wretches in blood." In another development, Ukraine's prison service chief said rebels had attacked and destroyed the prison guard's headquarters in Donetsk in a bid to seize weapons. Serhiy Starenkyy told Interfax-Ukraine news agency that staff had been evacuated. President Poroshenko said the recapture of Slavyansk on Saturday was "the start of a turning point in the fight against the militants". But he warned it was too early for celebrations. The rebels said they had staged a "tactical retreat" to Donetsk. Ukrainian Interior Minister Arsen Avakov said some rebels had surrendered or were trying to escape by blending in with the civilian population. But those who remained appeared to be heading next for the town of Horlivka, he said on his Facebook page, and were being confronted on the road by government troops. The current crisis started last November when then President Viktor Yanukovych decided not to sign an agreement with the EU. The decision led to street protests in Kiev, and Mr Yanukovych was eventually overthrown. The developments angered Russia, which annexed Ukraine's Crimea region. Violence erupted in eastern Ukraine in April, when pro-Russian separatists declared independence in the Donetsk and Luhansk regions. Ukraine and the West have accused Russia of fomenting unrest, a claim strongly denied by the Kremlin. 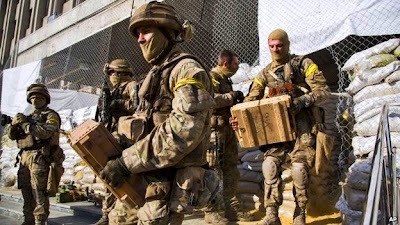 On Saturday morning, the insurgents abruptly abandoned two of their main bases of operations, cities which they triumphantly overran three months ago and have maintained as a symbol of their dominance in Ukraine's east. The question that no-one can answer right now, however, is whether this in fact constitutes a turning point in the conflict. The rebels still seem to have large numbers in their ranks, and significant stores of weapons and military hardware. They continue to control a decent amount of territory in the east, though this apparently has been circumscribed somewhat in recent days. They say they are motivated and will fight to the last man. Nevertheless, there are indications that the fall of Slavyansk may indeed have been a watershed moment.